From family get-togethers to romantic hideaways, these cosy cabins are the perfect place to practice the art of “coorie” and snuggle down for the winter. The RiverBeds luxury lodges are stylish wee (and we really do mean wee!) cabins set in beautiful woodland on the edge of Glencoe. The lodges are essentially individual hotel rooms, perfect for two people to cosy up in, combining the luxury of a hotel suite with the privacy of your own mini cabin. The lodges, which are perched on the edge of a peaceful river, are full of all the mod cons, including underfloor heating, Costa coffee machines, flat screen TVs and free wifi. There’s even a hot tub so you can warm up on a chilly evening before retreating back to your comfy bed for the night (complete with Egyptian cotton sheets, of course). In the morning, you’ll even be brought a complimentary continental breakfast basket, packed full of croissants, pastries and orange juice. 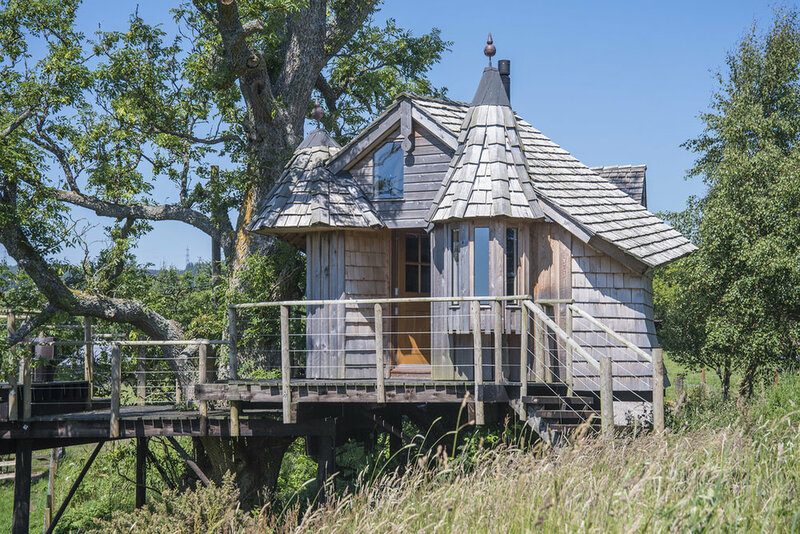 A completely unique self-contained treehouse built around an ancient ash tree, The Tree Howf boasts amazing 360 degree views of the Ochil Hills and beyond. The whole thing has been lovingly handcrafted, giving this unusual cabin a wonderfully rustic vibe. Above the kingsize bed is a specially made stargazing window, so you can look up at the stars without having to brave the the cold winter nights. There’s also a woodburning stove to snuggle up in front of and plenty of blankets to wrap yourself up in as you enjoy the view from the balcony. The owners, Ian and Heather Kier, have a range of other quirky “howfs” nearby - from converted steadings and summer houses to hobbit holes. For cosy cabins with an eco-friendly twist, visit The Lazy Duck at Nethy Bridge, near Aviemore. Choose from a waterside lodge, forest cabin or homestead bothy, or opt for the mini hostel for up to eight guests. The individual cabins each have their own character, and have evolved of four decades as sustainable places to stay in the Scottish Highlands. This isn’t the place to go if you’re looking for luxury, but it’s the perfect cosy retreat to unwind, relax and get back to nature. Bring a good book, plenty of red wine and enjoy the forest walks by day and the sauna and hot tub by night. Coille Na Creige Lodges is a family-run business set within a gorgeous 12 acre woodland on the Black Isle near Inverness. Enjoy a little bit of traditional luxury in the Canadian-style log cabins, kitted out with all the comforts of home - plus a hot tub and woodburning stove for ultimate hygge vibes. The secluded location makes it the perfect place for a relaxing romantic getaway, or a peaceful family holiday, and pets are welcome too. There are plenty of beautiful woodland walks and cycle paths to explore on crisp, frosty days, and the nearby beach is the ideal spot for dolphin-watching in the Moray Firth. For the luxury of a hotel combined with the freedom of a self-catering lodge, book yourself a stay at Crieff Hydro’s Cozy Cabins this winter. Situated just a five minute walk from the main hotel, the cabins (which sleep up to five people) allow you to do you own thing. Fancy spending the weekend curled up by the fire playing board games? Not a problem. Want to get dressed up for dinner and cocktails? Just throw on your favourite party dress and head over to the Hydro’s Meikle Restaurant. Take advantage of Crieff Hydro’s spa to enjoy a relaxing massage or sauna session, followed by a cosy evening tucked up in your very own cabin. Eagle Brae describe themselves as a rugged-luxe log village resort - sounds magical, right? Hidden away in an unspoilt valley between Glen Affric and Glen Strathfarrar, it really is a fairytale setting. Whether you want to explore the nearby glens and mountains, or would just like to admire the scenery from your window, Eagle Brae’s location is hard to beat. The log cabins themselves come in a variety of shapes and sizes, offering accommodation for between two to six people. The cabins have been lovingly handmade from giant red cedar logs, and Himalayan wood carvings add plenty of charm to the interior. Built with the environment in mind, grass insulated roofs and eco-friendly wood burners help to ensure the cabins are sustainable as well as luxurious.